If you were one of the many children who grew up watching Sesame Street, you may remember a certain puppet duo named Bert and Ernie. Now, it's always annoying when a social justice movement tries to co-opt a formerly politically neutral topic into something that it's not and that is what is happening to our dear friends Bert and Ernie. A former writer for the show Mark Saltzman said that Bert and Ernie are a gay couple, and secretly they always have been. Sesame Street released an official statement on the matter that denied Saltzman's claims the couple is gay. "I remember one time in a column from The San Francisco Chronicle, a preschooler in the city turned to Mom and asked, 'Are Bert and Ernie lovers?' And that, coming from a preschooler, was fun," Saltzman said Sunday. on Sunday, September 16. "That got passed around, and everyone had their chuckle and went back to it." Saltzman went on to say, "I always felt that without a huge agenda, when I was writing Bert and Ernie, they were. I didn’t have any other way to contextualize them." 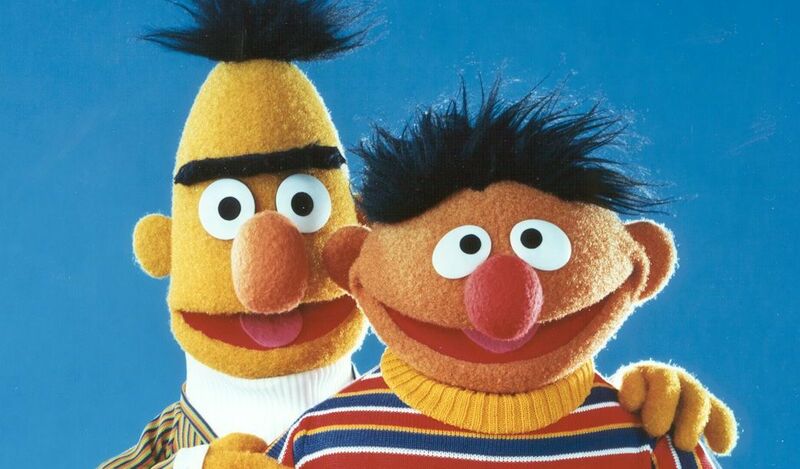 The two puppet characters would go on to become so popular that TV writer Saltzman and his partner, film editor Arnold Glassman began being referred to as "Bert and Ernie" themselves. "It was the Bert and Ernie relationship, and I was already with Arnie when I came to Sesame Street," he told the website. "So I don’t think I’d know how else to write them, but as a loving couple." Although Saltzman saw the duo as a couple, he admitted he "would never have said to the head writer, ‘Oh, I’m writing this. This is my partner and me'." The show was quick to slap down any claims from Saltzman that the two puppets are gay and released a statement saying, "As we have always said, Bert and Ernie are best friends. They were created to teach preschoolers that people can be good friends with those who are very different from themselves. Even though they are identified as male characters and possess many human traits and characteristics (as most Sesame Street Muppets do), they remain puppets, and do not have a sexual orientation." A handful of so-called fans of the show were very vocal about the news that Bert and Ernie are not diddling each other. Some Twitter users pointed out the decades-long relationship between Miss Piggy and Kermit the Frog, while others claimed the news had "broken their heart". One soy boy commenting on the Sesame Street post said, "Right, because Sesame Street didn't show heterosexual muppets or human relationships at all! I'm not triggered by this, just all the backlash and "phew" posts. They straights are so threatened by homosexuality. So what if Bert and Ernie were partners? Que Sera, Sera!" Another Twitter user said in response to the statement from Sesame Street, "Deeply, sorely, unbelievably disappointing statement. Absolutely reprehensible, you should be ashamed. You had an opportunity to teach children an actual lesson about people "different from themselves" and you not only dropped the ball, you spiked it & flipped LGBT kids the bird." Another user said, "Why can't to males just be friends?" This is just the latest example of the liberal left trying to co-opt a previously established creation and try to force it to fit their "woke" narrative and if you don't like it then you must be a bigot, a sexist, and a homophobe. The LGBT community loves to call out people for being homophobic for not being inclusive, yet when a heterosexual person shows pride in their sexual orientation they are shouted down by the same community claiming to seek equality for all sexual orientations. One recent example was the "Straight Pride" badge that was offered for sale on Amazon. Members of the LGBT community harassed the seller with claims of bigotry and claimed the badge was only meant to "make fun of queer people". The backlash ultimately led to the seller being forced to remove the badge from Amazon. Saltzman's claim that the duo was based on his own homosexual relationship may be true, but it doesn't mean that the characters themselves are gay. Saltzman told Queerty, "I was Ernie." The former Sesame Street writer went on to say, "I look more Bert-ish. And Arnie as a film editor — if you thought of Bert with a job in the world, wouldn’t that be perfect? Bert with his paperclips and organization? And I was the jokester. So, it was the Bert and Ernie relationship, and I was already with Arnie when I came to Sesame Street. So I don’t think I’d know how else to write them but as a loving couple. I wrote sketches… Arnie’s OCD would create friction with how chaotic I was. And that’s the Bert and Ernie dynamic." World-renown puppeteer Frank Oz, a man perhaps best known for being both the puppeteer and voice actor of Star Wars' green Jedi master Yoda, weighed in on the conversation with reason and common sense. Oz tweeted, "It seems Mr. Mark Saltzman was asked if Bert & Ernie are gay. It's fine that he feels they are. They're not, of course. But why that question? Does it really matter? Why the need to define people as only gay? There's much more to a human being than just straightness or gayness." Let us see here…. The San Francisco Chronicle (Gayville news) and the Writers are most likely PRO-Homosexual and are wanting to ACT out . The creator has said that the writers are full of crap. To me this is just another less than 3% of America pair of Gay males , screaming… Look at US, we are doing something unnatural and we want attention.